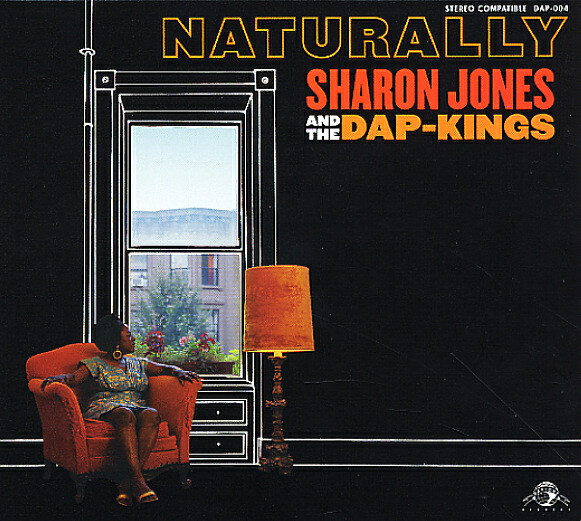 The long-anticipated second album from Sharon Jones & The Dap Kings is a stunner – undoubtedly stronger than the group's fantastic debut – and a record that not only transcends the late model funk revival genre, but stands on footing as solid as the best hard funky soul of the late 60s and early 70s! If you're expecting a rehash of the heavy funk jams that burned on the Dap Dippin' album you won't be disappointed, but get ready for a deep, natural (hence the title) soulfulness that not only caught us off guard, but really forms the big, hard-beating heart of the album. The frothing, frenetic funk is as tight as ever, and in spots just as furious, but the attention to songcraft this time out is just as searing and indelible. The eight piece Dap Kings continue to be the best band in the land – with El Michels on baritone sax, Neal Sugarman on tenor, Homer Steinweiss on drums, not-so-secret weapon Bosco Mann on bass, vibes and piano. Guest appearances include fellow Daptone powerhouse vocalist Lee Fields on the the duet "Stranded In Your Love", and strings courtesy of the Bushwick Philharmonic, but make no mistake, this is the band's album. Amazing stuff from in indispensable group – an album that'll keep spinning in our circles for as many years as the great albums by the gritty soul forefathers do! Tracks include "How Do I Let A Good Man Down? ", "Natural Born Lover", "My Man Is A Mean Man", a soulful reading of Woodie Guthrie's "This Land Is Your Land", "Your Thing Is A Drag", "Fish In A Dish" and "All Over Again". © 1996-2019, Dusty Groove, Inc.